Utah’s responses to being 0-2 in Pac-12 play and later losing key players showed the team’s toughness. (Trent Nelson | The Salt Lake Tribune) Utah Utes linebacker Cody Barton (30) tackles Oregon Ducks running back CJ Verdell (34). Utah Utes host the Oregon Ducks, NCAA football at Rice-Eccles Stadium in Salt Lake City on Saturday Nov. 10, 2018. At times this season, Southern Cal linebacker Jordan Iosefa was absolutely right. Utah did look like “just a regular team” in significant chunks of the Utes' three losses and even parts of their nine victories. Yet the way the No. 17 Utes overcame those struggles is exactly why they’re extraordinary. Utah persevered on the way to the program’s first Pac-12 title game Friday vs. No. 10 Washington at Levi’s Stadium in Santa Clara, Calif.
“What’s been consistent is the leadership of the team and how they just bounce back,” Ute athletic director Mark Harlan said Monday. In the end, Barton just needed the Washington component to complete his prediction. The Huskies beat Washington State on the road to win the Pac-12 North title. Washington was the division’s favorite all along; Utah was picked second behind USC in the Pac-12 South. By the time they beat Iosefa’s Trojans in mid-October, the Utes were in the middle of a breakthrough season — after playing through a rough September and before knowing what was to come in November. The Utes' responses at those checkpoints proved they were far more than “just a regular team.” That’s the phrase Iosefa used in an attempt to explain that the Trojans' problems in a 41-28 loss to Utah were their own doing. “We just messed up,” he said. The Utes and their fans viewed it as disrespect, naturally, and football players thrive on that stuff. Defensive end Bradlee Anae and reserve running back TJ Green jumped on the #justaregularteam theme on social media and many teammates used it as motivation. The Twitter accounts of Utah Football, Utah Athletics and all four Utah graduate assistant coaches also seized upon it. The first critical stage of the season came after the Utes followed the loss to Washington with a tough defeat at Washington State, losing a fourth-quarter lead via an 89-yard touchdown pass allowed by cornerback Julian Blackmon. The Utes visited then-No. 14 Stanford, carrying a sense of desperation. “We've been through a lot of stuff this season, and we've just prevailed,” Blackmon said after Saturday's comeback win over BYU. It all started at Stanford, where the key plays just kept coming: Jaylon Johnson returned an interception 100 yards for a touchdown in the second quarter. Maxs Tupai made a third-down sack when Stanford trailed 30-21, having scored touchdowns on three straight possessions. Tyler Huntley escaped the rush and heaved a pass that Samson Nacua caught for a clinching touchdown. That 40-21 win launched Utah’s 4-0 October. Then came November, historically a rough month for Utah in the Pac-12 era. 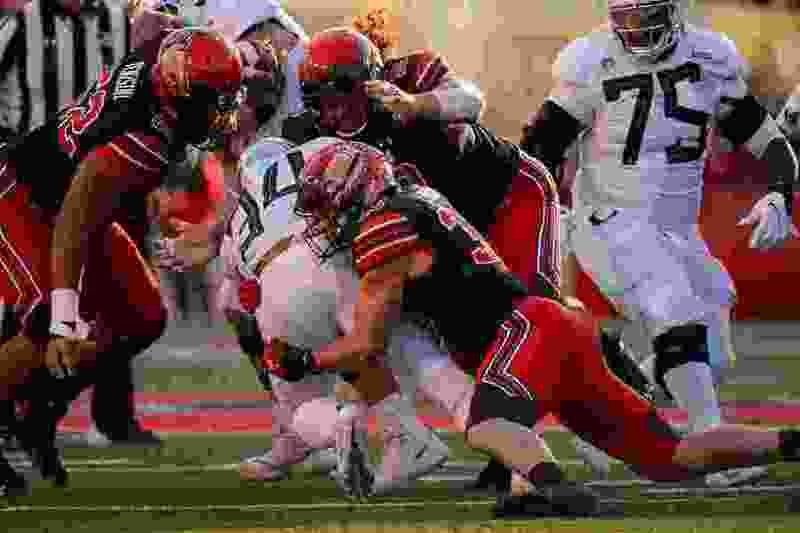 November 2018 became even more difficult as the Utes lost Huntley to a broken collarbone in a defeat at Arizona State and Zack Moss to a season-ending knee injury four days later. In between those personnel setbacks, “They went right back to work that Monday, and it was a phenomenal week of practice,” coach Kyle Whittingham said. Next man up? Apparently so. Whittingham understands how that mantra can seem callous to outsiders, but the Utes know he’s not disregarding the injured players. That's how the Utes succeeded against Oregon and Colorado to conclude Pac-12 play. And when Oregon turned around and helped them by beating Arizona State, the Utes were the South champs with a 6-3 conference record. Utah trailed Oregon 25-22 after a blocked punt led to the Ducks' go-ahead touchdown. Having struggled in the third quarter, redshirt freshman quarterback Jason Shelley completed passes on three straight plays, leading to a touchdown. Tupai’s third-down sack and Johnson’s fourth-down pass deflection got the ball back, then running back Armand Shyne ate up most of the remaining time in a 32-25 win. At just the right time, Utah’s offense and defense played well and the groups fed off each other. The performance, after a first half that made Whittingham criticize his players for getting “pushed around” and “sleepwalking,” was not something that just a regular team could produce. To make it to the Rose Bowl, the Utes undoubtedly will face one or more of those crossroad moments against the Huskies, and they’ll have to come through again. Regardless of the Utes' bowl assignment in December or January, Iosefa and his USC teammates will have nothing to do other than watch them play. YOU CAN'T BRING ARMAND SHYNE DOWN.